Comics, like computers, began in America as the weird playthings of those on the nerdy end of the social spectrum. Today, they are a bastion for print publishing, holding fast against the ever-rising digital tide. Perhaps no one is more responsible for the ascendency of comics than Françoise Mouly, Art Editor of The New Yorker. Along with her husband, comic book luminary Art Spiegelman, author of best-selling “Maus,” Mouly brought comics from the fringe underground of basement bookstores to the haute-couture of The New Yorker covers and museum retrospectives. Thursday, Mouly will give a Penny Stamps lecture in which her love of print publishing and the comics medium will serve as focal points to encourage future generations to push boundaries and recognize opportunities to keep print publishing thriving. Like many French kids, Mouly grew up with children’s comics, so when she moved to New York at age 19, she thought there would be no better way to learn English than through captioned illustrations. Yet there were no comics in the mainstream bookstores or on the newsstands. A friend introduced her to the underground cartoonist Art Speigelman, and she fell in love with the artist’s advocacy for his medium — and later with the artist himself. Through the 1980s, the two co-edited RAW magazine, an annual anthology of the year’s best and most progressive work in the comics genre. “I wanted to make an object that showed all of the possibilities of how comics could function to tell stories, to illustrate articles, to show very different styles,” Mouly said in an interview with The Michigan Daily. “That this wasn’t just science fiction or superheroes, but it could be literature; it could be art. RAW was quite a DIY operation: Mouly was its publisher, designer, production manager and printer, using her own printing press located in their Soho loft. Mouly and Spiegelman chose the comic strips together, resulting in editorial diversity. The same is true of Mouly’s work as the Art Editor of the New Yorker. Mouly sees The New Yorker as a publication that values not only the aesthetic merit of comics and cartoons, but also the medium’s power to make a statement, political or otherwise. Mouly’s process of choosing a New Yorker cover takes the form of an ongoing conversation with the artist to come up with the right image at the right time. As a weekly general interest magazine, The New Yorker has a quick response time to current events, but isn't expected to cover everything that happens. Mouly’s New Yorker cover can either stand on it’s own as a stylized illustration of seasonal/cultural themes or can serve as a timely commentary on a breaking issue of the day. “I’m in a dialogue with the artists so what I try to do is to encourage them to use this cover of a magazine as a forum to address the concerns that they might have … I actually believe that those cartoonists and those graphic storytellers should be telling the story of our times,” Mouly said. 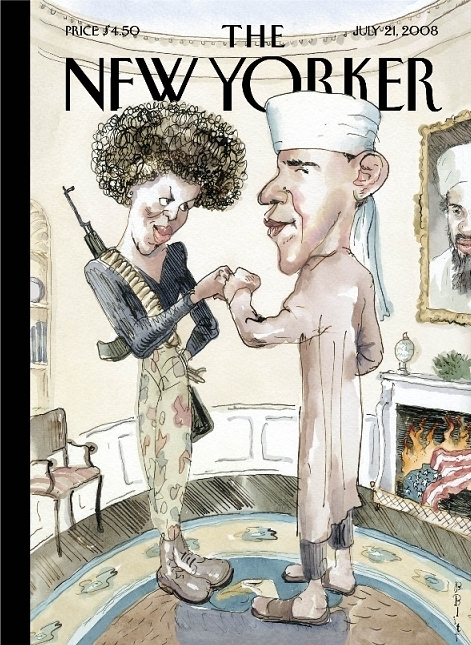 She famously edited the controversial cover in 2008 depicting Barack and Michelle Obama as closet militant revolutionaries in Arab garb fist-bumping their election to the White House — a caricature of those who really believe it. The controversy was that the targets of the caricature — and there was no shortage of them in our nation — didn’t get it, seeing instead a magazine cover that perfectly captured their views. In 2012, Mouly published a collection of the covers that didn’t make the magazine entitled “Blown Covers: New Yorker Covers You Were Never Meant to See.” The selectivity is the product of a high volume of sketch submissions, yet sometimes the message is not quite right for the magazine. The collection stands as a testament to Mouly by showcasing the breadth and depth of the art that her editorship generates, revealing Mouly’s taste for the provocative and her discerning eye among it. Mouly is also the publisher and editorial director of TOON Books, a series of comics for kids. As a mother, Mouly recognized that hard copy comics can occupy a special place for children the way they did for her. Mouly views comics as a transformative keyhole for kids to see through to power of art and literature in their lives. “It’s great medium for kids and it is how you map out a future for kids to love books and to love reading and to get into holding a story. It has some magical component because when you read a book by a cartoonist whether it be Dr. Seuss or Maurice Sendak or William Steig, you see the hand of the artist who actually made those marks and told that story,” Mouly said. Mouly doesn’t ignore digital technology at The New Yorker. She edited a cover drawn on an iPad, by David Hockney, for the first iPad edition of the magazine and has edited animated covers for the online edition. Comics, more so than typeset books, convey the physical act of creation. Maybe that’s the reason their fans tend to demand them in print rather than digital form. Mouly includes the genre among her pantheon of saviors of the print publishing industry.